Math, Geometry Problem 1208: Triangle, Circle, Excenter, Diameter, Perpendicular, 90 Degrees, Equal Areas. Online High School, College. 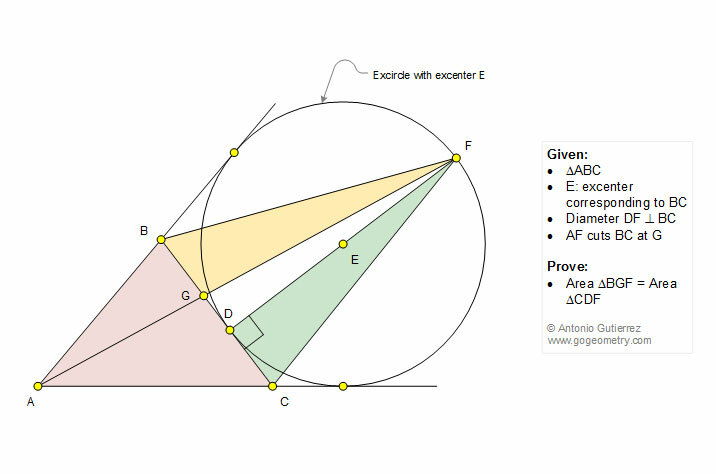 Geometry Problem 1208: Triangle, Circle, Excircle, Excenter, Diameter, Perpendicular, 90 Degrees, Equal Areas. Online High School, College. The figure shows a triangle ABC with the excircle E corresponding to BC and diameter DF perpendicular to BC. AF cuts BC at G. Prove that the areas of triangles BGF and CDF are equal.